Archives : NIFTY HOLDS AMIDST GREECE DRAMA - 04/07/2015. NIFTY HOLDS AMIDST GREECE DRAMA - 03/07/2015. The Greek drama has been taking centre-stage for entire of last month and now it seems to be headed for an outcome in the form of referendum this Sunday. A ‘Yes’ vote will be market positive even though the current government will opt to resign. A ‘No’ vote will be market negative which may lead to exit of Greece from the Euro-zone. Interestingly in Asia, China has seen its worst sell-off since 1992 as the Shanghai Composite has cracked more than 30% in last three weeks, and around 12% this week itself. In such global turmoil, Nifty has done well to hold its own and gain more than 1% this week. Sensex opened the week at 27451, made a high of 28135, low of 27209 and closed the week at 28092. Thus it closed the week with a gain of 281 points. At the same time the Nifty opened the week at 8247, made a high of 8497, low of 8195 and closed the week at 8484. Thus the Nifty closed the week with a gain of 103 points. On the daily charts, both the indices have formed a Last Engulfing Top. It is a bearish reversal pattern which requires confirmation in the form of a bearish candle on Monday. 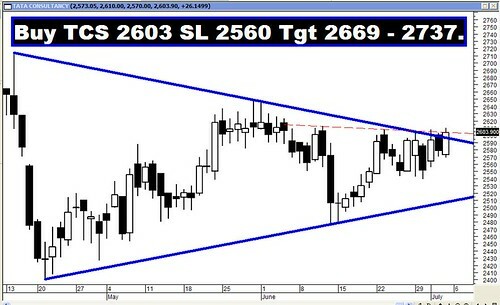 On the weekly charts, both the indices have formed Side by Side White Lines which is a bullish continuation pattern. Thus daily formation requires a bearish confirmation to start bearishness whereas the weekly formations suggest continuation of bullishness. The market is witnessing a pull-back of the fall from Sensex 30024 to 26307 and Nifty 9119 to 7940 and the relevant correction levels are 27727-28165-28604 for the Sensex and 8390-8529-8668 for the Nifty. Hence the long term uptrend will resume once Sensex manages to stay above 28604 and Nifty above 8668. A close above Nifty 8668 will signal a move towards all time high levels. This week, both the indices dipped lower on Monday and took support exactly at the Bullish Upward Gap between Sensex 27202-27175 and Nifty 8195-8186. Sensex made a low of 27209 and Nifty made a low of 8195. Thus Sensex 27209-27175 and Nifty 8195-8186 will act as strong Support zone. Only when the indices close below this support zone, it will indicate resumption of downward trend. This week both the indices successfully tested not only the long term average of 200dma (Sensex – 27794 and Nifty – 8377), but also the medium term average of 50dma (Sensex – 27317 and Nifty – 8258) and the short term average of 20dma (Sensex – 27281 and Nifty – 8231). Thus the trend in the short term, medium term and long term timeframe continues to remain bullish. This week both the indices made a bullish Head & Shoulders but it is not significant as the pattern should have formed in a downtrend but here it has formed in sideways trend. Bearish pattern formations still remain intact and hence one can still expect indices to achieve the target of Bearish Rising Wedge pattern which falls at 26049 for the Sensex and 7882 for the Nifty, as well as Ascending Broadening pattern and the target for that pattern is at Sensex 25034 and Nifty 7533. Coupled with this, both the indices had also completed a Head and Shoulders pattern and the target as per this pattern is at Sensex 24486 and Nifty 7425. MACD and Price ROC are both positive and continue with their Buy signal. RSI (63) indicates continuation of bullish momentum. Stochastic Oscillator %K (95) is above %D, thereby continuing a Buy. MFI (85) has now entered overbought zone, suggests a cautious approach to be adopted. OBV still continues to make lower top lower bottom formation thereby giving a non-confirmation. ADX has decreased to 18, suggesting that the indices are in consolidation mode. Directional Indicators continue with a Buy as +DI remains above –DI. Thus majority of Oscillators are suggesting a moderately bullish bias in the near term. Options data for July series indicates highest Put Open Interest buildup at the strike of 8000 and highest Call build-up is at the strike of 8500. Thus Option data suggests a trading range with support coming in at 8000 and resistance around 8500.